Incognito login function bug fixed. Retired "Form Button" feature so that the extension does not need to require "access to all salesforce.com sites". 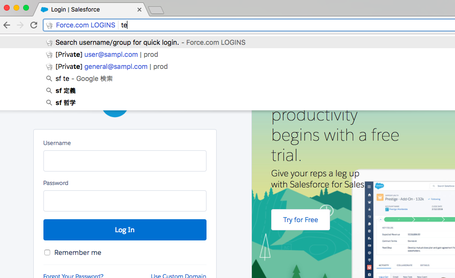 You can fill account credentials into the salesforce login page which is already opened in your current tab. 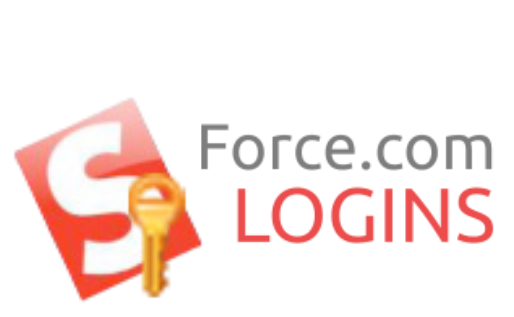 This button works only when you have login page with salesforce.com domain opened in your current tab. This extension now needs read and change access permission to all salesforce.com sites since this feature needs to access the existing tab with salesforce.com domain in its url. The subscription auto renewal bug is fixed. 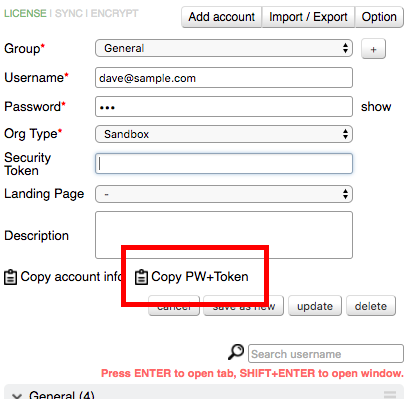 You can now copy password + security token to clipboard. With the address bar quick login feature, you can now search group name and description as well as username. If you want to assign specific shortcut key to an account, you can make use of the description field. Matching characters are now highlighted. * This feature is available for paid license. 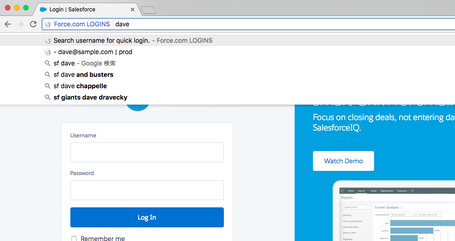 You can now quickly login to your salesforce account from Chrome's address bar. Type in "sf " in address bar to activate quick login. Type in search keyword for username. Matching account will be suggested (partial match). Select an account and hit enter to log in. You can now drag and drop the account group to change the group display order. The up/down arrow has now been retired. You can now collapse/expand the account groups. The extension remembers groups' toggle status, so you can keep the groups you don't often use collapsed. You can now display your accounts in your preferred order. This option is available in the option page.